Struck at the height of US gold coin production, the $1 Liberty Head Gold Coin is one of the most iconic in American history. Among the most popular coins, by volume, ever produced by the US Mint, surviving coins from this series are extremely rare. Of the millions of coins produced throughout the run of this series, only a few thousand survived the Great Depression. 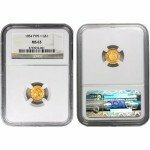 Now, $1 Liberty Head Gold Coins are available from Silver.com. Consists of .0483 ounces of .900 pure gold. Struck by the US Mint with a $1 (USD) face value. When the Great Depression sunk its teeth into the US economy, the finances of Average Joes and the federal government alike were ruined. In 1933, President Franklin Roosevelt ordered the collection of all circulation gold coins. The coins were melted down into gold bars to boost the nation’s reserves. The coins that survived have become in-demand collector’s items sought after by collectors and investors everywhere. Some of these coins are over 150 years old today. 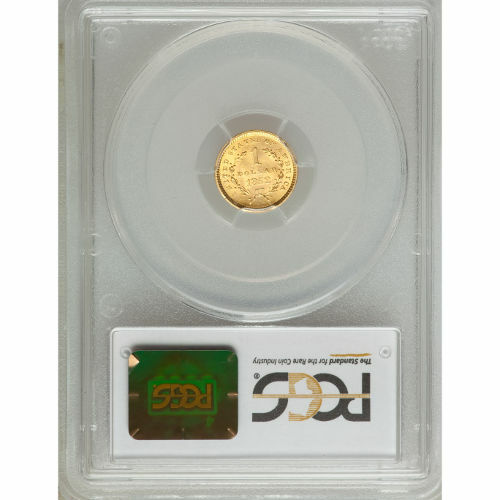 The $1 Liberty Head Gold coin is part of a long-running series of $1 Gold Coins struck by the United States Mint. These Liberty Head Dollars are classified as Type 1 coins. In the program, Type 1 coins were minted between 1849 and 1853. The influx of gold from the California Gold Rush left the Treasury Department with more gold than it knew what to do with. This gold was used in the production of brand new coins for circulation in the economy. These coins are available in Mint State 65 condition, meaning each still possesses a high quality luster, with small contact marks and no more than two large marks or hairlines visible. If you have questions about these products, don’t hesitate to contact a Silver.com associate at 888-989-7223. You can also chat with us online or send us an email. 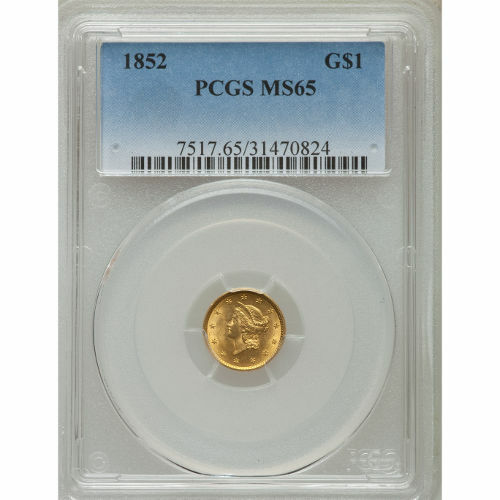 If you are interested in similar products, check out this MS62 graded $1 Liberty Gold Dollar.